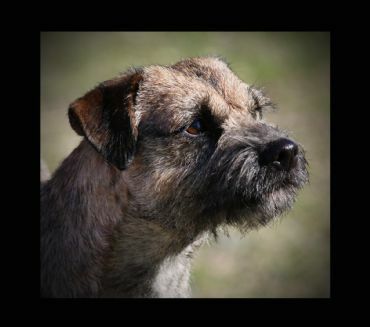 Rikki goes Best in Show at the Border Terrier Club Of Vic 2012 under Terrier Judge, Mrs Susan Kealy (Ireland ), With her handler Jodie. Great one girls, we are so proud of you and Rikki. Critique: well balanced, happy mover, liked her attitude, good head and expression, excellent bite, nice top line. 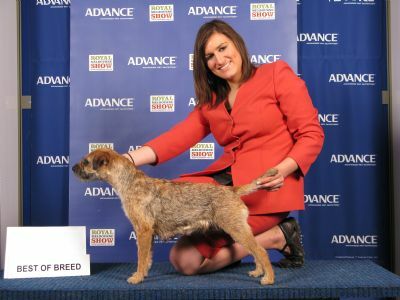 Rikki goes Best of Breed at Royal Melbourne Show 2010 in some stiff competition the Judge was Mr Satoshi Bessho (Japan). Not bad as she had puppies 7 weeks ago. This spectacular little girl will be making a big entrance into the show world, and strutting her stuff..
You can tell by looking, this kid is going to be a stack of fun to show! Watch out for Rikki,her next project is tracking, following in her father's and daughter's foot steps. 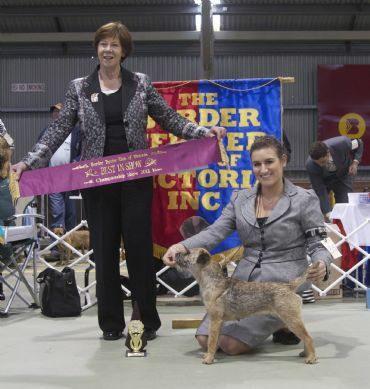 Well she's followed in her daughter and fathers foot steps with gaining her TD title in 2013 and then this year she gained her TDX title and then her Tracking Dog Champion title at the Tracking Club of Vic at Inverleigh on the 18th August 2014, she finished this being the clown of the day, keeping Judge Gary and Sue Keane laughing around most of the track. She had fun. What a combination, 3 gens, Father , Daughter, and Granddaughter all Dual Champions Tracking Dog.